Education is very important in today's world. For many people, it's the best path to a secure and stable future. In the Information Age, learning can now be done via computer. That said, many students are now spending more time looking at the monitor. One school principal in China decided to prevent that from happening to his students. Instead of conducting seminars on the topic, the principal actually leads his students in a dance performance during break time. China's economy is as strong as ever, and many of its companies are at the forefront of technological innovation. But what became viral this weekend wasn't a Chinese company. Instead, it was a school principal named Zhang Pengfei of the Xi Guan Primary School. 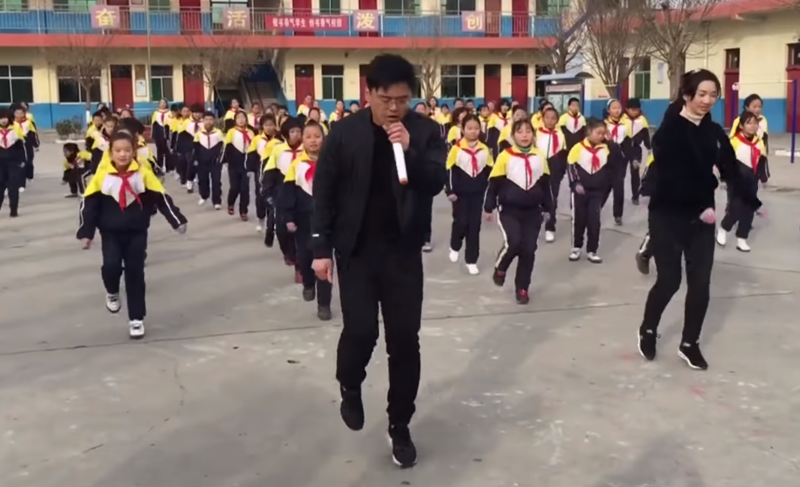 This primary school, located in the country's Shanxi province, gained the spotlight after a video of its principal leading the students in a shuffle dance went viral. In China, schools have to provide a 30-minute exercise routine everyday. But according to Zhang, their playground wasn't big enough to accommodate all 700 students when it came to sports and other athletic events. So, Zhang decided to try a different route. The students had calisthenics, but they didn't seem to enjoy it very much. To engage his students in exercise, the principal decided to learn the shuffle dance himself. After rigorous practice, he taught the dance to his students. Accompanied by a happy rhythm, the shuffle dance became popular in school. The students loved it, and even the teachers can be seen smiling in the viral video. According to Principal Zhang, this exercise was better than having students run to the computer for fun. It also made their school famous! The 40-year-old educator said that his students favored his shuffle dance over the government-recommended calisthenics. This school has been performing this shuffle dance or "guibu" since October. The principal reportedly saw the dance performed in a public square last summer and was inspired to learn it for his school. South China Morning Post captured one of the school's dances, but the viral video had managed to already receive more than 250 million views on Weibo, China's largest social media site. It isn't just computers that the students are now staying away from. According to Zhang, his students used to constantly be on their phones, playing games or using social media. Now, they're looking up new dance routines. The new exercise has certainly made them more active. Zhang broke with tradition when he introduced the shuffle dance, but it was a change for the better.